A season gives the perfect reason to sew a lovely patchwork project for you or your loved ones that will be cherished year after year! 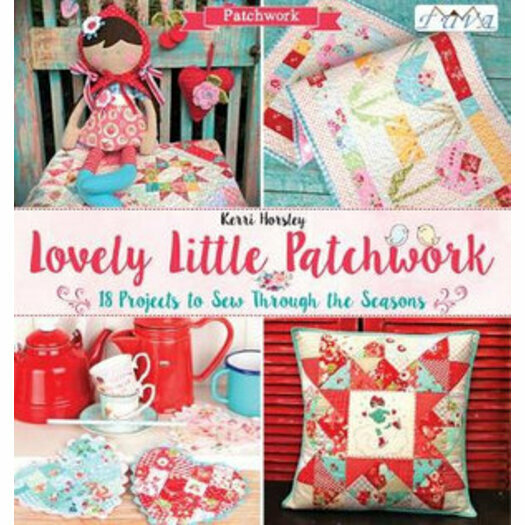 In Lovely Little Patchwork you will find 18 projects to sew while giving your creativity a chance to blossom through the new beginning of each season. You can stitch a lovely pencil pouch while your children are about to embrace an upcoming school year. Or while the snowflakes are falling from the sky; embroider a sweet vintage inspired ice skating girl. Then, as the flowers are blooming and the fresh smell of spring is in the air, you can learn a new technique of hand sewing yo-yos and then create a pretty garden apron. When the warmer weather arrives and the sound of waves are upon you; stitch up a patchwork sailboat. Even if your seasons are slightly different, I'm sure you will find great inspiration from one of the many pretty patchwork projects to sew any time of the year! Kerri Horsley was born in Tehran, Iran and raised in Seattle, Washington. She has six children and a loving husband. Kerri has contributed to several sewing books and magazines.